This barn quilt at Fairbury’s Healthy Harvest Farm is named “Fertility.” Since the quilt has been put up, the farm has grown and prospered…with two different farm buildings and the farm garden has expanded! Kelly Kinate grew up around the Fairbury IL area, while his wife, Cindy, grew up near Chicagoland. Cindy thinks of herself as country girl, remembering when she was young how her grandma had a garden. She feels that educating and ever learning about what pops out of the soil is necessary. When they came back to Fairbury after being away for years, they planted a garden, pronto! That was a start. But it didn’t end where it started. It grew. And it grew. And it grew. Soon they had enough produce for their family and friends. Kelly also had a “tomato route” where he delivered produce to elderly friends who were no longer able to garden. There were often invites in for a cup of coffee, some cookies and a visit. He enjoyed his route so much (cookies?) that Cindy sometimes had to hide some tomatoes so there would be some for them! This just led for more and more tomatoes to be planted! And everybody was happy, and someone was cookie-satisfied! They now grow mainly heirloom varieties started lovingly from seed many weeks before transplanting them outside. They grow a variety of produce focusing on heirlooms, tomatoes, peppers, eggplants, herbs. They also like to grow unusual things not readily found in grocery stores. Purple tomatillos, purple jalapenos, purple peppers, apples, pears and should they say whatever else that meets their fancy! The Kinates love the land and love people. 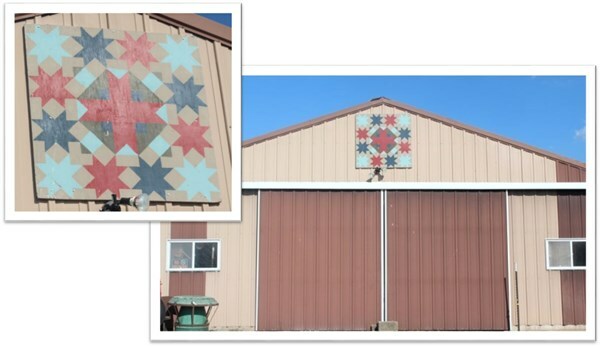 Their barn quilt on their farm is just one “sign” of how they show their love. They have beef, poultry and bees on their farm. They sell eggs to Chicago and now are selling honey. In the winter months, they literally have “meat in their freezer” from their farm. They work with other farms through their Stewards of the Land, LLC network of whom they are members. These farmers help one another with sharing and networking. Swing by their farm and notice the barn quilt. This farm is a “drive by” as it is a working farm, but has no retail store. Have a questions? You may call Kelly and Cindy Kinate (815) 692-3227 and if they don’t answer, just leave a message for them to return. They take time to remember their family and friends and strangers-soon-to-be-friends.